December | 2016 | Florida Simulcast Group, Inc.
With help from our technical committee members (Matt KA9RIX, Ryan KJ4SHL, & Bryan W9CR) the St Pete Site is online. 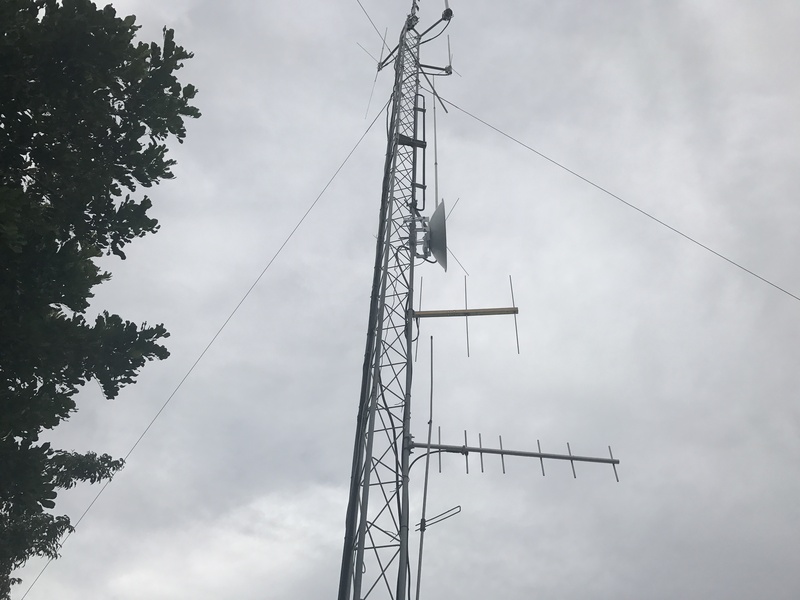 We worked from 8am to 6:30pm on the 29th of December to mount the radios on the r oof, run and terminate cable, ground all cables, move the 7′ rack up a flight of stairs and install the router. 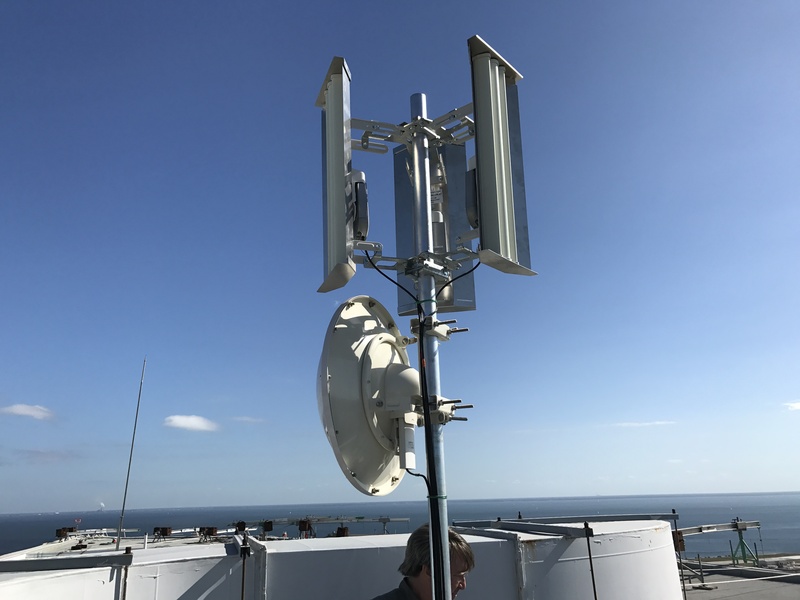 This new site is 400′ high in the center of Downtown St Petersburg and will ensure solid coverage of the city and beaches to our standard 30dbi client radios. All in all it went very well, and the major parts were in place by lunch time, with the 7′ rack being the fun part. 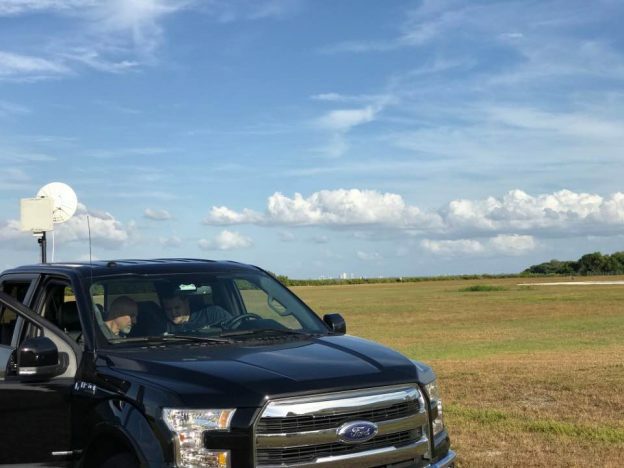 We had to remount the 3.4 GHz link to Tampa, but fund it was aligned very well on the Tampa end with a -65 dBm signal and 130 mbit/s solid signal over 16 miles away. We still need to tweak the alignment at Tampa, but it’s working well for general use now. 3.4 GHz is a great band for linking on as there is practically no noise across Tampa Bay. 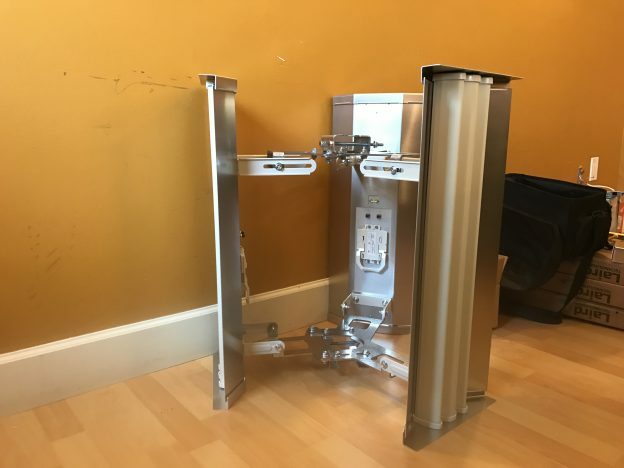 After the router (Juniper EX4200) was installed ISIS would not come up between the Tampa and St Pete Sites so we decided to pack it in for the day. We did have remote access from Tampa to the St Pete router and I was able to track the problem do to a WDS mode setting in the UBNT M3 radio link. With a software upgrade the ISIS protocol packets now passed across the backhaul link and routing was able to come up later Thursday evening. We did some testing on Friday of coverage around St Pete and found from downtown with a 60 dBm signal 45 Mbit/s was achieved to a client radio. From Gandy Blvd and 4th Street North a solid -75 dBm signal was achieved at ground level with out a clear Line of Sight (LOS). At the Bay Pines VA hospital a -80 dBm signal was had. 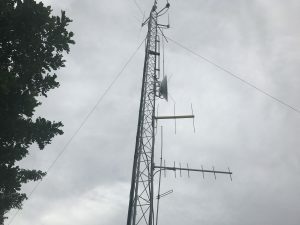 We installed a test client at Matt’s QTH at 25′ and found a non-line of sight -75 dBm signal. We suspect going up another 10′ will greatly improve this signal. This is over 10 miles away and we’re achieving a signal able to do 15 Mbit/s. p at -87 dBm and get an IP address. He didn’t have much ability to test but was able to browse a couple internet sites. This was really unexpected and quite amazing! 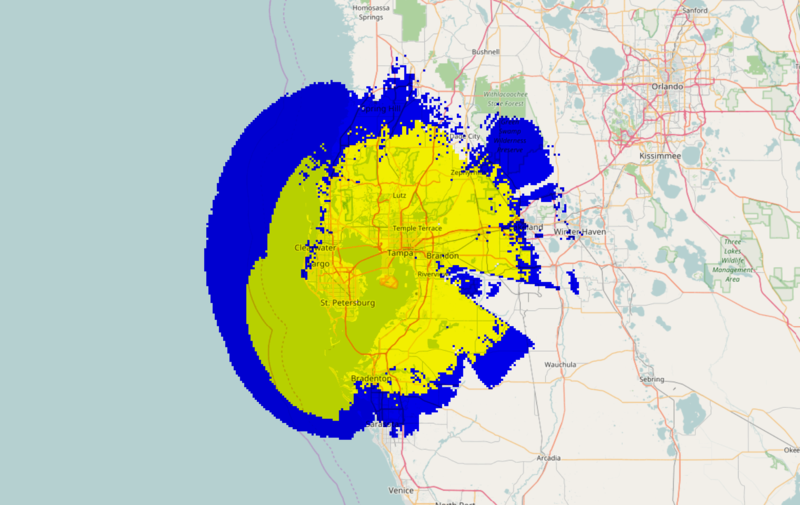 We have a plot of expected coverage from the St Pete site with the 30 dBi client radio at 30′. The inner contour is for -75 dBm, and the outer is for -85. 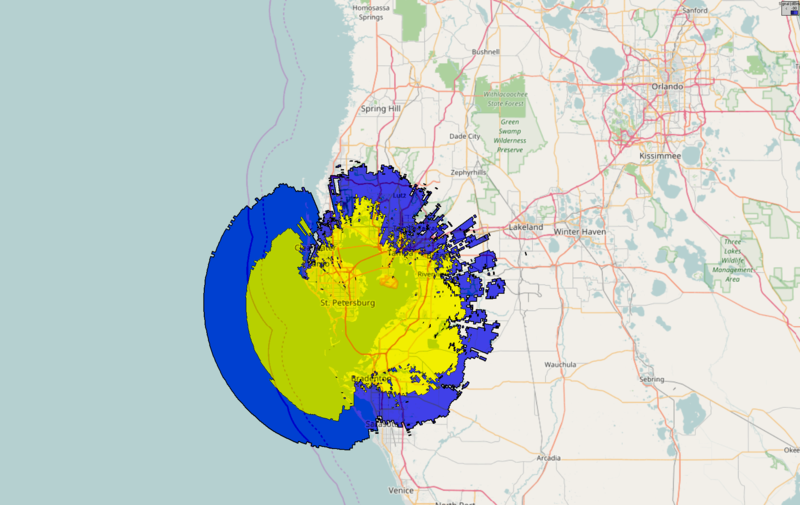 This next map shows the combined coverage from the other Tampa site. This is predicting a 75dbi signal in the yellow at 30′ for 70% of the time. You can download a google earth overlay of this. This entry was posted in HamWAN on December 31, 2016 by bryan. We did some testing with a new client radio today, the Mikrotik DynaDish 5 from the St Petersburg Clearwater airport. At 8′ off the ground we had a -69dBm signal from the antennas 22 km (13.75 Mi) away in Tampa. A speed test showed a 22 Mbit/s throughput. Once installed higher on the roof the signal should improve to -62 to -65 dBm and provide a great link into the HamWAN. This entry was posted in HamWAN on December 27, 2016 by bryan. We’re making progress on bringing HamWAN to St Pete. FSG has secured a site downtown and we have a full 3 sector setup and backhaul ready to go up. The sectors are ready to go, and we expect to have 220, 440 and 900 MHz repeaters up at this site over the coming months too. We expect this to fill in all over St Pete and southern Pinellas County. This entry was posted in HamWAN on December 21, 2016 by bryan.